About 18 months ago I sat in the audience at an Open Government Partnership event eagerly waiting for the UK Prime Minister to take the stage. Along with over 75,000 ONE members across Europe, I’d been frantically campaigning to make sure that the identity of the people who own and control companies and trusts would be made available to the public. As part of our wider campaigning on transparency and accountability, this would mean that citizens – especially those in developing countries – could follow the money so often siphoned away through a web of fake companies, and hold their leaders to account when money goes missing. On that day, David Cameron committed to an open and accessible register of company owners, and not only that, he called out ONE campaigners as the driving force behind the move. The UK Government’s bold action meant we could shout loudly in Europe to get our neighbours to follow suit as part of the Trillion Dollar Scandal campaign. Last year the EU Anti-Money-Laundering Directive was fiercely negotiated and resulted in agreement that information on company ownership would be made available to those with a “legitimate interest”. 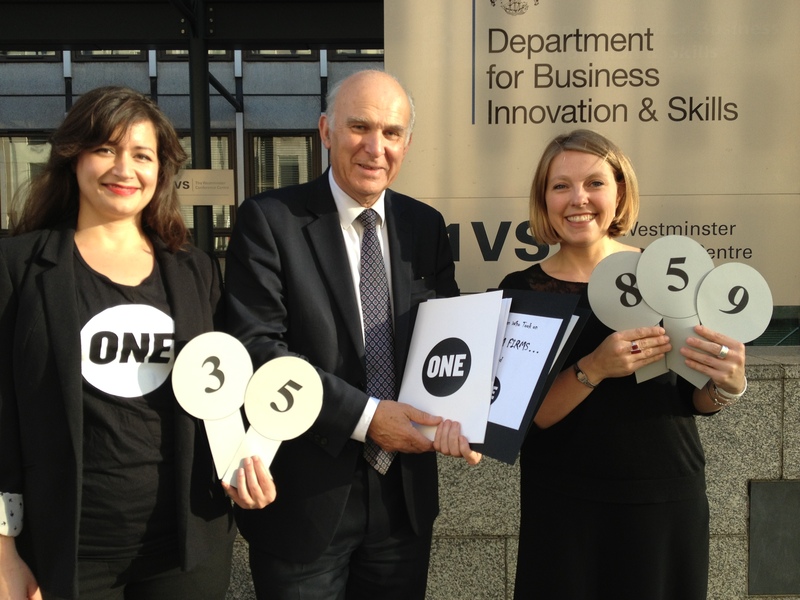 Presenting our petition to UK Business Secretary, Vince Cable MP. Then last week, the Queen signed off on a new law (the Small Business, Enterprise and Employment Bill) that ensures that information about company owners will be made public. And it happened because YOU took action. You signed our petition, sent tweets, met with Ministers, handed out leaflets (very early in the morning!) and made your voices heard at the highest level. The fight isn’t over. There’s more to do in Europe – EU member states should follow the UK’s lead and define “legitimate interest” as public access. Whilst the UK must take further action on trusts. Still, it it deserves one heck of a celebration. It’s not every day the Queen makes a law because you asked her to.